Juan C. del Alamo is a professor in the Mechanical and Aerospace department at UCSD where he studies the mechanics of eukaryotic cells and soft-bodied animals, and is developing novel non-invasive methods to image intraventricular flow. He received his Ph.D. in Aerospace Engineering in June 2005 at the E.T.S. de Ingenieros Aeronauticos in Madrid, Spain. 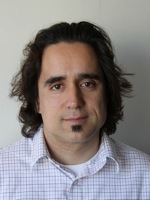 After completing his Ph.D., Juan C. del Alamo served as a Postdoctoral Research Associate at Harvard University School of Public Health and a Fulbright Postdoctoral Fellow at UCSD. He has received the 2006 “ERCOFTAC Da Vinci Award” for the best European Thesis in Fluid Mechanics and Combustion. He is also a recipient of the US Geographical Survey Director’s Award for Exemplary Service to the Nation, the NSF CAREER Award, and a Hellman Fellow. At UCSD, his courses include Aerodynamics, Fluid Mechanics, Numerical Methods, and graduate courses in bio-mechanics such as Mechanics Inside the Cell.